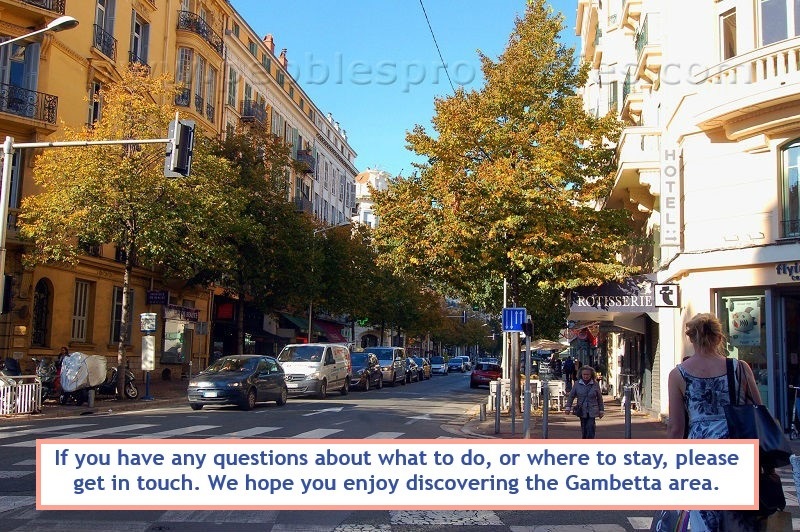 Boulevard Gambetta creates the divide from centre Nice and West Nice. 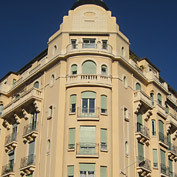 Central Nice is boxed in by boulevard Gambetta on the West, avenue Carabacel on its East, avenue Joseph Garnier on the North, and the Promenade des Anglais on its South, with avenue Jean Medecin running directly down the centre. 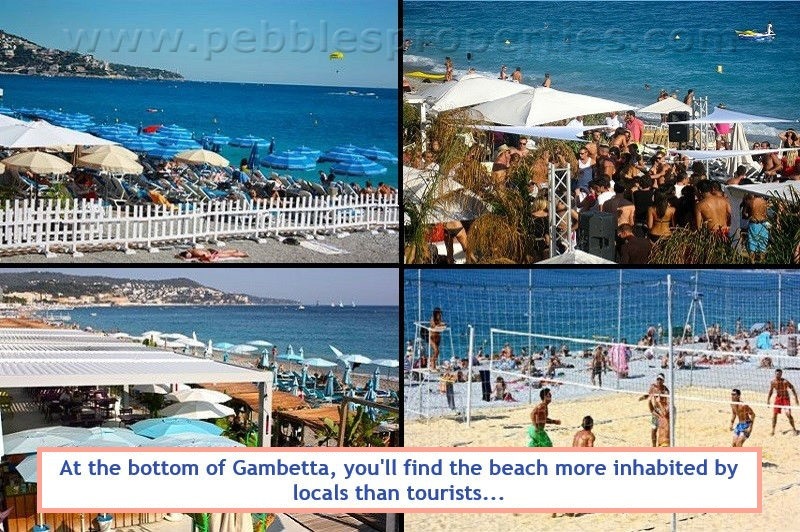 Starting from the Promenade, Gambetta is a popular beach area for the locals. 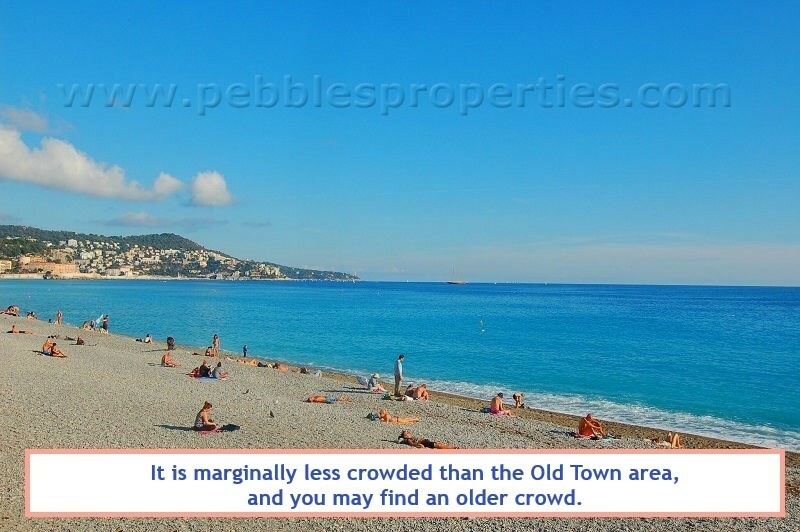 This is mainly because of its smaller pebbles and a steady descent into the water compared to the larger pebbles and steep descent often found on the beaches nearer to the Old Nice end of the Promenade. It is marginally less crowded than the Old Town area, but not noticeably. Though you may find there is a more mature crowd. These private beaches also tend to be more family friendly with wading pools and small playgrounds for the kids. Here can also be found the famous Negresco beach and the newest luxury edition, HI Beach, which caters to the health conscious serving bio fruit smoothies and sushi for snacks, while offering English morning Yoga classes, beach massages, and ultra-hip ambient electro music nights. On the Promenade and Gambetta you will also find the hottest nightclub in town: High Club. With large 100 foot ceilings, dancers, and trendy nightclub goers, there is usually a queue for entry. It will cost 20 euros to get in including a free first drink. Bring photographic ID. There is a private club in the back for guests over 30. 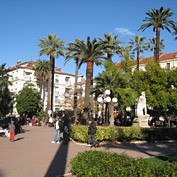 Boulevard Gambetta is a main road in Nice and consequently busy. The trade off is that there countless shops in the area and its lively and cosmopolitan. You will find plenty of specialty gelato places and yummy bakery and cake shops. One of the more famous ones found directly on Gambetta is Canet. It offers the most delectable sweets and cakes imaginable. 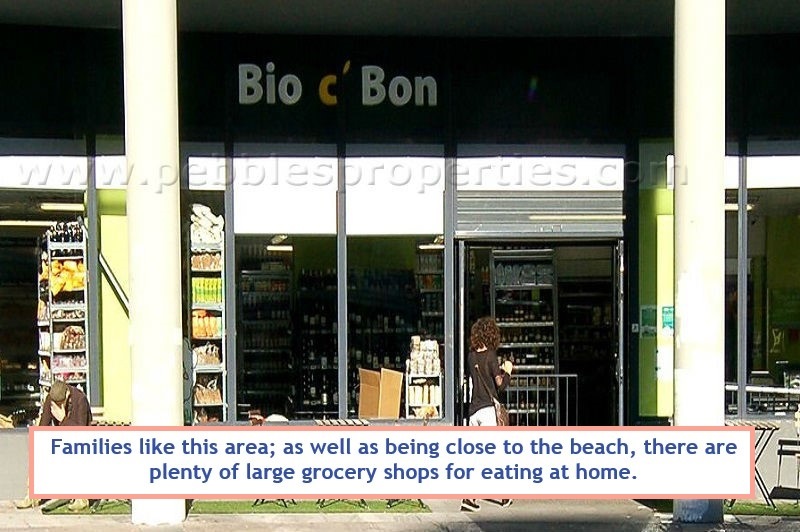 There are also plenty of large grocery shops, Intermarché and Casino, being the two largest. Also found here is a narguilé shop (flavored tobaccos) on Gambetta, a luxury tea shop at Route du Téa on rue Rivoli, and the largest English (Original Version) cinema in Nice, Cinema Rialto on the same street. You can also find the newly redone and reopened Museum of Art and History, in the Palais Masséna. Entry is on the Promenade or Rue de France. The Fleurs area is considered one of the most desirable areas to live for the locals. 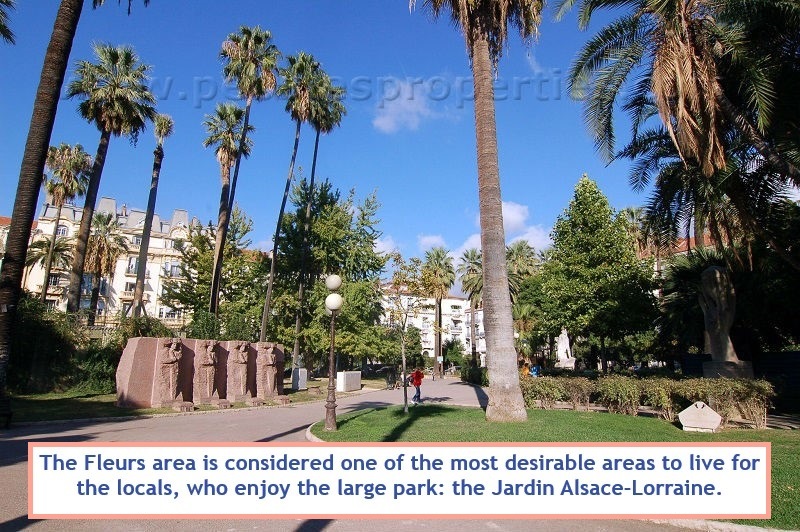 It is still close to the beach but away from the usual tourist track, and the area enjoys a large park, the Jardin Alsace-Lorraine. With mature roses, fountains, statuettes and a fenced in children’s playground you will find the park packed with locals enjoying their lunch on one of the sunny park benches. 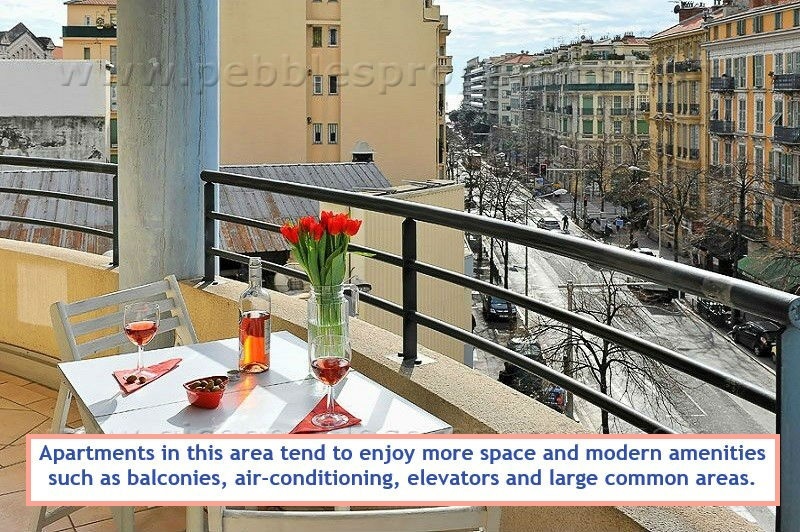 It is quite common to find air-conditioning and quiet outside space in our rental apartments on this side of Nice. 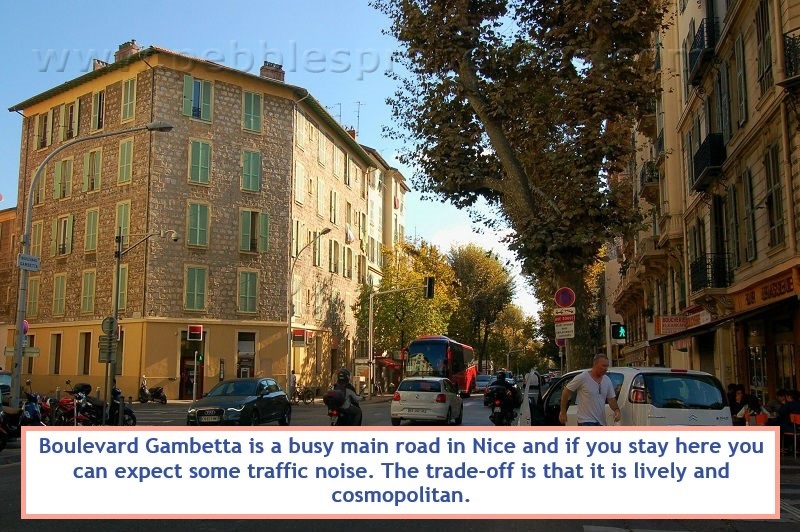 At the top of Gambetta runs the edge of the Musicians area, starting at Rue Verdi and the close by Nice Ville Gare SNCF, which easily takes you to either edge of the Cote d’Azur in minutes. 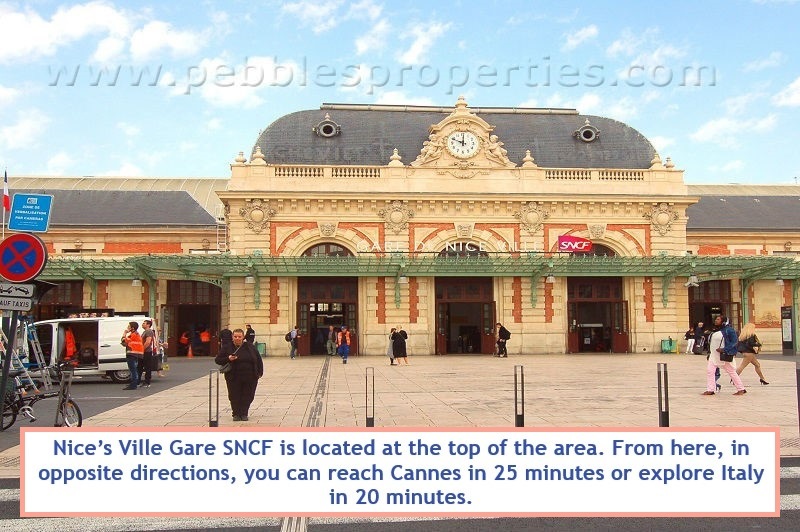 You can find Cannes in 25 minutes or Italy in 20 minutes in opposite directions. Just past the train station area, avenue Thiers, and under the bridge you will see the beautiful gold and turquoise onion of the largest and oldest Russian Orthodox Cathedral outside of Russia. Spend an early afternoon there and enjoy a picnic lunch on the grounds then take a sneak peek inside for only a few Euros. Further up north is mostly residential with the occasional interesting gem. If you want to explore, try the Bonsai Centre, a plant nursery and florist for orchids and bonsai’s, or practically next door the second hand store, TERRY’S at 96, boulevard Gambetta. 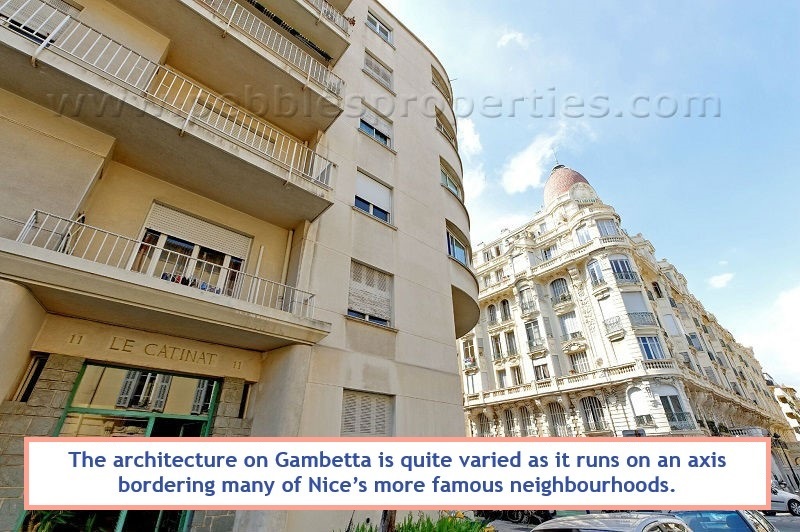 The architecture on Gambetta is quite varied as it runs on an axis bordering many of Nice’s more famous neighborhoods. From the Promenade, you will find the Belle Époque style until you reach les Fleurs area where Belle Époque is mixed with Art Deco. Apartments in this area tend to enjoy more space and therefore private gardens of their own.